Shocking! Shocking I say! PlanetPOV has uncovered the truth about Orly Taitz and though she claims to be a citizen of Wack-ovia, she was in fact born in Kenya! 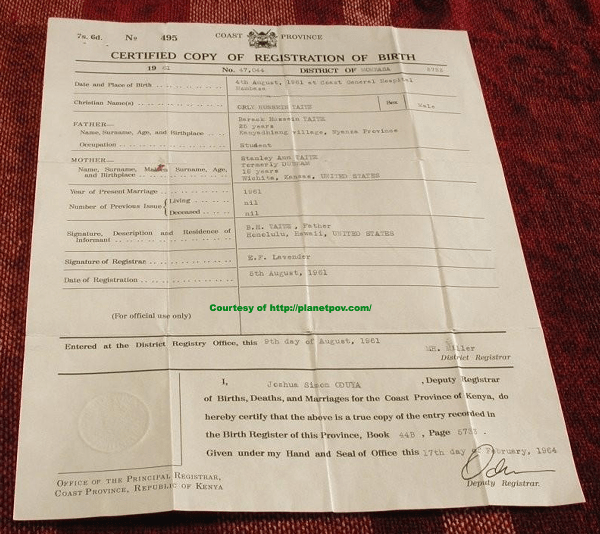 Look at the indisputable evidence, a copy of her Kenyan birth certificate! The Birther movement suffered a severe blow with this revelation and the news that Lou Dobbs has been rushed to the hospital complaining of shortness of breath…due to his head being jammed in a posterior orifice. I don’t know if anyone caught it but the faux Obama birth certificate was actually a doctored birth certificate for an Australian citizen that posted it on a genealogy website. Yep, saw that on MSNBC as the news was breaking. Kind of sad that proving something that was an obvious fraud was an obvious fraud is “news”. Orly Taitz circa 2009 = Arianna Huffington circa 1999. If you hear them talk they both have eerily similar accents and are both filed with the same vial and personal attacks. Expect Orly Taitz to “become a progressive” and start her own faux progressive website. The difference between Orly Taitz and Arianna Huffington is that one is a shallow, shamelessly self-promoting, unethical person who merely wants to build her own celebrity and importance by jumping on board high profile issues while the other believes President Obama was born in Kenya.